African American civil rights leader Malcolm X was a major twentieth-century spokesman for black nationalism. Unlike many other African American leaders of this time, who supported nonviolent methods, Malcolm X believed in using more aggressive measures in the fight for civil rights. Malcolm X was born Malcolm Little on May 19, 1925, in Omaha, Nebraska. His father, a Baptist minister, was an outspoken follower of Marcus Garvey (1887–1940), the black nationalist leader. (A nationalist is a person who promotes one nation's culture and interests over all others.) Garvey supported a "back-to-Africa" movement for African Americans. During Malcolm's early years, his family moved several times because of racism (dislike and poor treatment of people based on their race). They moved from Omaha, Nebraska, after being threatened by the Ku Klux Klan, a group that believes that white people are superior to all other races. While living in an all-white neighborhood in Michigan their house was burned. When Malcolm was six years old, his father was mysteriously murdered. The black community was convinced that white people had committed the crime. Three of Malcolm's four uncles were also murdered by white people. By the 1930s the nation had fallen into the Great Depression, a decade-long period of great economic hardship. Work was scarce, and Malcolm's family struggled. For a time his mother and her eight children lived on public welfare. When his mother became mentally ill, Malcolm was sent to a foster home. His mother remained in a mental institution for about twenty-six years. The children were divided among several families, and Malcolm lived in various state institutions and boardinghouses. At thirteen Malcolm was charged with delinquency (behaving in a way that is against the law) and was sent to a juvenile detention home (a place where young people are held in custody). He dropped out of school at the age of fifteen. Living with his sister in Boston, Massachusetts, Malcolm worked as a shoeshine boy, a busboy, and a waiter. In Boston Malcolm began visiting the black ghetto (an area of a city where a minority lives) of Roxbury. There, he was drawn to the neighborhood's street life. He began wearing flashy clothing and jumped into a criminal life that included gambling, selling drugs, and burglary. In 1942 Malcolm moved to New York City's Harlem neighborhood where he continued his unlawful lifestyle. He adapted well to the New York City street life and rose quickly in the criminal world. Malcolm became known as Detroit Red, for his red shock of hair. When the police uncovered his criminal activities, Malcolm returned to Boston. 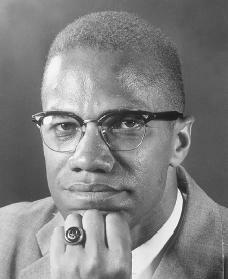 In 1946, at the age of twenty, Malcolm was sentenced to ten years in prison for burglary. While in prison he began to transform his life. He began reading books on history, philosophy, and religion. In prison his brother Reginald visited him and told Malcolm about the Black Muslims. The Black Muslims were an Islamic religious organization whose official name was the Lost-Found Nation of Islam. The leader of the group was Elijah Muhammad (1897–1975). to finding his new religion while in prison, Malcolm began copying words from the dictionary and developed the vocabulary that would help him become a passionate and effective public speaker. In 1952 Malcolm was released from prison, and he went to Chicago, Illinois, to meet Elijah Muhammad. There he was accepted into the movement and given the name of Malcolm X. Malcolm believed the "X" represented his "slave" name that was forever lost after being raised in a mainly white nation. Malcolm X became assistant minister of the Detroit Mosque, or Muslim house of worship. The following year he returned to Chicago to study personally under Muhammad, and shortly thereafter was sent to organize a mosque in Philadelphia, Pennsylvania. In 1954 he went to lead the mosque in Harlem. Malcolm X soon became the most visible national spokesman for the Black Muslims. As the voice of the organization he was a speech-writer, a philosopher, and an inspiring speaker who was often quoted by the media. His debating talents against white and black opponents helped spread the movement's message. At this time in the United States there was a major movement for racial integration, or bringing the races together in peace. However, Malcolm X and the Black Muslims were calling for racial separation. He believed that the civil rights gains made in America amounted to almost nothing. He criticized those African Americans who used nonviolent methods in order to achieve integration. Malcolm X called for self-defense in the face of white violence. Malcolm X urged black people to give up the Christian religion. He preached that the high crime rate in black communities was basically a result of African Americans following the lifestyle of Western, white society. During this period Malcolm X, following Elijah Muhammad, urged black people not to participate in elections. These elections, the movement believed, meant supporting the immoral (against the ideas of right and wrong held by most people) political system of the United States. In 1957 Malcolm X met a young student nurse, Betty Jean Sanders (1936–1997), in New York. She soon became a member of the Black Muslims. They were married in 1958, and she became Betty Shabazz. The couple eventually had six daughters. By 1959 the Black Muslim movement had moved into the national spotlight. Racial tensions were reaching a boiling point, and white Americans grew fearful of Malcolm X and his message of black supremacy (the belief that the black race is better than all others). By 1960 Black Muslim membership had grown to more than one hundred thousand. As the movement reached its peak, some observers felt that there were elements within the Black Muslim movement that wanted to oust Malcolm X, or force him from office. There were rumors that he was planning to take over leadership from Elijah Muhammad and that he wanted to make the organization political. Others felt that the personal jealousy of some Black Muslim leaders was a factor. On December 1, 1963, Malcolm X stated that he saw President John F. Kennedy's assassination as a case of "The chickens coming home to roost." Soon afterward Elijah Muhammad suspended him and ordered him not to speak for the movement for ninety days. On March 8, 1964, Malcolm X publicly announced that he was leaving the Nation of Islam. He said he was starting two new organizations: the Muslim Mosque, Inc., and the Organization of Afro-American Unity. He remained a believer in the Islamic religion. During the next months Malcolm X made several trips to Africa and Europe and one to Mecca, a city in Saudia Arabia that is the holiest city of the Islamic religion. Based on these trips, he wrote that he no longer believed that all white people were evil and that he had found the true meaning of the Islamic religion. He changed his name to El-Hajj Malik El-Shabazz. Malcolm X announced that he planned to take the black struggle to an international audience by putting black people's complaints against the United States before the United Nations (UN). For this purpose he sought aid from several African countries through the Organization of Afro-American Unity. At the same time he stated that his organizations were willing to work with other black organizations and with progressive white groups in the United States. Together, these organizations would work on voter registration, on black control of community public institutions such as schools and the police, and on other civil and political rights for black people. Malcolm X began holding meetings in Harlem at which he discussed the policies and programs of his new organizations. Then, on a Sunday afternoon, February 21, 1965, as he began to address one such meeting, Malcolm X was assassinated. Since his death Malcolm X's influence on the political and social thinking of African Americans has been enormous, and the literature about him has only grown. Alex Haley's 1965 book, The Autobiography of Malcolm X, was written from several interviews conducted with Malcolm X before he died. It is now considered a classic in African American literature. Malcolm X Community College in Chicago, Malcolm X Liberation University in Durham, North Carolina, and the Malcolm X Society are all named for him. Breitman, George. The Last Year of Malcolm X: The Evolution of a Revolutionary. New York: Merit Publishers, 1967. Lomax, Louis. To Kill a Black Man. Los Angeles, CA: Holloway House Publishing Company, 1968. Lomax, Louis. When the Word Is Given: A Report on Elijah Muhammad, Malcolm X and the Black Muslim World. Cleveland, OH: World Publishing Company, 1963. Myers, Walter Dean. Malcolm X: By Any Means Necessary. New York: Scholastic, 1993. Malcolm X. The Autobiography of Malcolm X. New York: Grove Press, 1965. Reprint, New York: Ballantine Books, 1992.
i don't really know what to say but Malcom was an icon and he shall continue to be that. i so much admire him. that was really good. i amd doing a project on him for englisha nd this telped me a lot. thank you! thanks a million!this was very helpful! ^_^ I got a good grade on my project 'cause of this! Brother Malcolm X did not believe in Black Superiority, he believed in empowering Black people. He believed that Black people were the original man ( which is true). Other than that the Bio was pretty accurate. I like this article. Provides alot of info and it give me knowledge on how and what Malcolm x stood for. I enjoyed reading about the civil rights leader, and how he had an epiphany when he reached Mecca. He had a strong desire to assist young black men and women to improve their self esteem. Although he embraced the Nation of Islam with the expectation of seeing black men and women achieve their desires and needs for home improvement, employment opportunities, properties, and their own businesses he left us African-American men and women with hope. I truly believed that when he went to Mecca and saw blue-eyed, blond, red and brown haired brothers and sisters that were hopeful to bring about a positive change in the lives of those that were in poverty. He is truly missed. I grew up as a Muslim and was ashamed of what Elijah Mohammed had ordered, in the killing of Malcolm X and I believe many believers in the the Islamic faith had dwindled because of the death of Malcolm X. It left a great hole in many of our lives!